Location: Rainford Station is at the end of Rail Close. Present state: Rainford Junction is still open (now renamed Rainford). The original buildings have been demolished but the former St Helens and Ormskirk line platforms can still be seen. Notes: Rainford Junction was situated on the Lancashire & Yorkshire Railway’s (LYR) Liverpool and Wigan line which opened on 28 November 1848. Originally promoted as the Liverpool & Bury Railway, which was then absorbed into the Manchester & Leeds Railway in July 1846, this company was one of the founding members of the LYR in July 1847. Although the village of Rainford was a mile south of the line, a station of this name was provided on the east side of Ormskirk Road. On 4 August 1853 the St Helens Canal & Railway Company (SHC&RC) obtained an Act to build a line from St Helens to Rainford and the East Lancashire Railway obtained, on same day, an Act to extend its Ormskirk-Skelmersdale line, then under construction, to Rainford to form an end on junction with the line from St Helens. The line passed over the LYR Liverpool and Wigan railway to the north of the existing Rainford station and connections, both of them facing east towards Wigan, were constructed - although the curve from the ELR line to the LYR line was not specifically authorised. To facilitate interchange between the two lines the LYR decided to build a new Rainford station east of the St Helens and Ormskirk line. The new station, Rainford Junction, opened on 1 February 1858. On the same day the SHC&RC began operating trains between St Helens and the new station. The trains to Ormskirk started operating a month later on 1 March 1958. The ELR was absorbed into the LYR just over a year later in May 1859. Located on the west side of News Lane which passed over the line on a bridge Rainford Junction had an interesting layout. The LYR line was a double track railway and the station was provided with two platforms. The main facilities were on the up platform (Wigan direction). They consisted of a large single-storey brick building under a shallow slate hipped roofed building with booking office, general waiting room, ladies’ waiting room and a room for station porters. The down platform (Liverpool direction) curved away from the main line at its western end where the St Helens line had its junction with the LYR line. The platform curved towards the south-west following the course of the line to St Helens for a distance of approximately 50yd. It followed the course of the St Helens line for that distance so that SHC&RC passenger trains could terminate at the station without obstructing the main line. The St Helens line platform was in effect a single platform terminus station in its own right, the combined length of which made it, so local rumour said, the second longest in the country. It was even provided with its own ticket office and waiting facilities in the form of a small wooden hut. 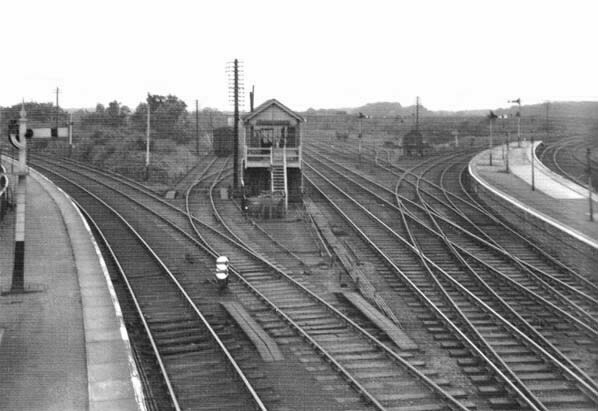 In the fork of the junction between the St Helens and the main line was the signal box that controlled the junction. A footbridge connected the St Helens platform (and the down main line platform) to the up platform. The up platform was almost a mirror image of the down as it also curved away from the main line but followed the ELR route to Ormskirk. A bay platform was provided for Ormskirk trains and this was opened on 1 March 1858. Initially, no passenger trains ran directly between St Helens and Ormskirk even though it was possible for them to do so as there was a direct line that avoided Rainford Junction. The avoiding line passed to the west of the station and ran from Randle Junction (south-west of the station on the St Helens line) to Bushy Lane Junction (north-west of the station on the Ormskirk line). The direct line was used by goods services and some excursions. SHC&RC trains ran only between St Helens and Rainford Junction and ELR Ormskirk line trains did the same. The services of both lines were however timed so that there were good connections between them. At the time of opening the St Helens platform at Rainford Junction was served by four trains per day. The 1869 timetable showed an increase to six trains each way on weekdays with three on Sunday. There were also six trains in each direction on the Ormskirk line. On 4 August 1864, the SHC&RC was taken over by the London & North Western Railway (LNWR). The way in which services operated remained the same but by 1904 there were eight trains in each direction on the St Helens line Monday-to-Saturday, all of which connected with LYR Ormskirk services. In 1907 the LYR introduced a railmotor service using Hughes Railmotor's and trailer carriages onto the Ormskirk and Rainford Junction service. With the introduction of the railmotor the passenger service between Ormskirk and Rainford Junction was intensified and there were 19 trains in each direction Monday-to-Saturday. As with the services prior to the introduction of the railmotor there were connections with St Helens services at Rainford Junction. By 1909 the St Helens service had increased to 12 trains each way on weekdays with three on Sunday. In 1911, the LNWR revamped the services on its line. They had similar plans to the LYR, but at the last minute, the LNWR decided to use motor trains using small 2-4-2T tank engines with 4ft 6in driving wheels and fitted with mechanical operating gear that enabled the driver in the driving cab of the coach to operate the engine’s regulator by means of a rod running underneath the coach. New coaches were specifically constructed for this service in 1911. St Helens services increased to 14 by 1914 but they had dropped back to 12 by 1915. There were some alterations to the numbers and timings of trains on Saturdays. The Sunday service remained at three trains. By 1920 through services were being operated by both companies, with three trains a day from each company making the through journey out of a total of 12 trains. A reversal was necessary at Rainford Junction and either Bushy Lane Junction or Randle Junction depending on whether the trains ran into the LYR or LNWR platform respectively. The Sunday service was discontinued around this time. On 1 January 1922 the LYR merged with the LNWR which meant that all services operating from Rainford Junction were provided by the same company. The separate ticket facilities on the St Helens platform were no longer required but the building was retained as a waiting facility. On 1 January 1923 the LNWR became part of the London Midland & Scottish Railway (LMS). Once the LMS took over, the original 4ft 6in 2-4-2T engines were withdrawn and replaced with the 5ft 6in version of the 2-4-2T, and the motor train operation was by the LMS vacuum system. The coaches were also replaced with LNWR coaches converted to use the vacuum system. The same type of engines and coaches were then used until closure. During the Second World War passenger services were reduced. Although they were increased after the war they did not return to the frequencies of the 1930s. On 1 January 1948 Rainford Junction became part of British Railways [LMR] (BR[LMR]). In 1951 BR[LMR] proposed the withdrawal of the St Helens and Rainford Junction service and the last trains ran on Saturday 14 June 1951. 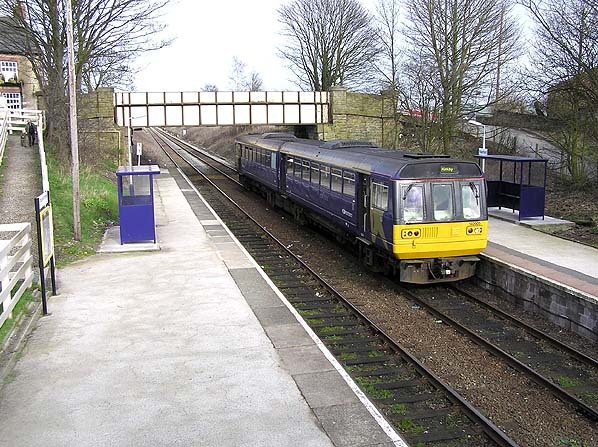 After that date the St Helens platform at Rainford Junction went out of use. Goods trains, always more numerous than passenger services, continued to pass through as did some passenger diversions and excursion services. Even in 1964 the St Helens line had two daily pick-up goods services calling at Old Mill Lane sidings with one continuing on to Rainford Junction, and there were five through freight trains running to/from the north-east. The Rainford Junction – Ormskirk service continued until Saturday 5 November 1956 after which Rainford Junction was left with only the services on the main line. The Ormskirk branch closed to all traffic in stages, the section between Bushey Lane Junction and White Moss Crossing closing to goods traffic on 16 September 1961 and the section between Skelmersdale and Ormskirk saw its last train on Monday 4 November 1963. Between Rainford Junction and Bushey Lane Junction signal box the line remained in use until 6 July 1964 as a means of reaching the yard controlled by Bushey Lane Junction signal box. The St Helens line closed as a through route on 6 July 1964 although the track remained in situ and signalled until 30 January 1967 when the remaining stub of the branch that remained active between Old Mill Lane and Pilkington Sidings was closed. In 1970 the line between Rainford Junction and Fazakerley was singled. By that time there was only an hourly service in each direction operated by DMUs. The service ran between Liverpool Exchange and Bolton. Rainford Junction was renamed Rainford in May 1973. On 30 April 1977 the line was truncated at Kirkby (the last through train having run on Friday 29 April 1977). The line between Kirkby and Walton was electrified as part of the Merseyrail system and passengers were required to change trains at Kirkby if they wanted to travel to or from points to the east of that location. The St Helens and Ormskirk line platforms could still be seen in 2015 but both were heavily overgrown with trees. Timetable from Paul Wright, tickets from Michael Stewart and route map by Alan Young. Kirkby Royal Ordnance Factory, Rainford, Upholland 1st, Wigan LYR 2nd and Wigan LYR 1st. St. Helens (3rd station), Gerards Bridge, Moss Bank, Crank, Old Mill Lane, Rookery 1st, Rookery 2nd, Rainford Village. Looking west from Rainford Junction station in 1949. The main line to Liverpool can be seen heading straight into the distance. Curving off to the left is the line to St Helens and to the right the line to Ormskirk. In the distance can be seen a bridge. It carried the direct line between the Ormskirk and the St Helens routes. The railways at Rainford Junction shown on a six-inch scale map from 1896. Running west to east is the Liverpool and wigan line and running south to north the line between St Helens and Ormskirk. 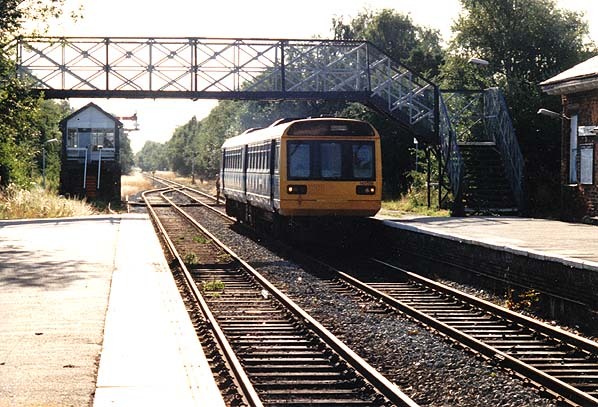 Passenger trains to and from the St Helens and Ormskirk lines used the spurs that ran from Randle Junction and Bushey Lane Junction so that they could serve Rainford Junction station. Rainford Junction shown on a 2:1,500 scale map from 1906. Rainford Junction station shown on a six-inch map from 1926. The connecting spurs to the Ormskirk and the St Helens lines are seen at the west of the station. 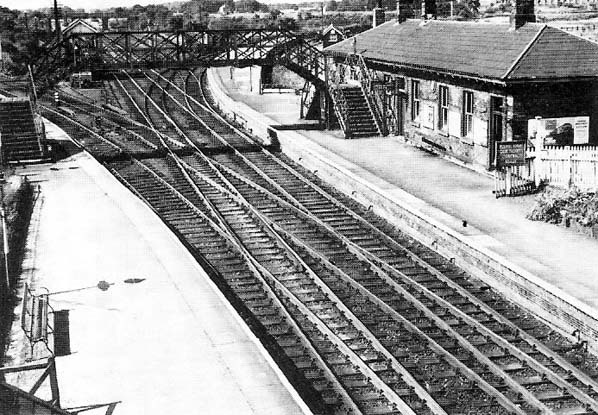 Rainford Junction looking west in 1956 - the Ormskirk platform is to the right with the St. Helens platform to the left. 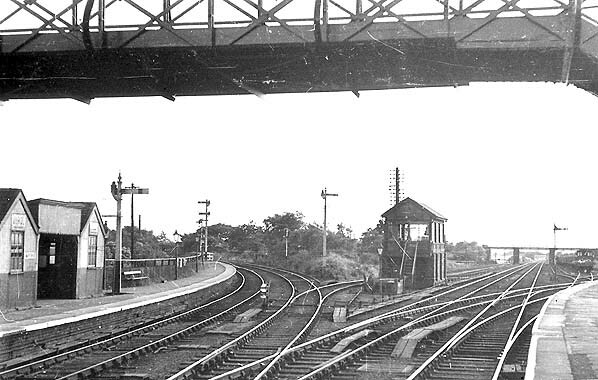 Rainford Junction station looking west in 1956. 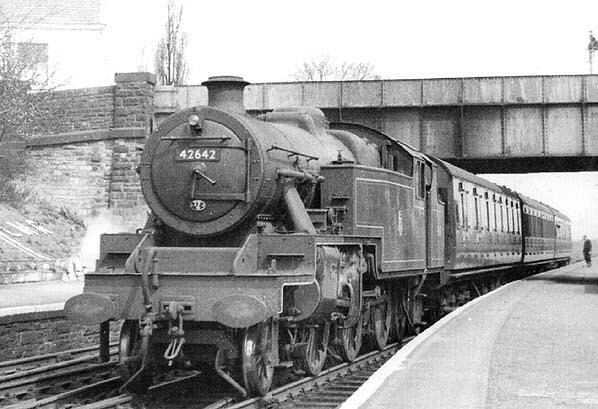 A Bolton to Liverpool Exchange service is seen departing from Rainford Junction in 1956. 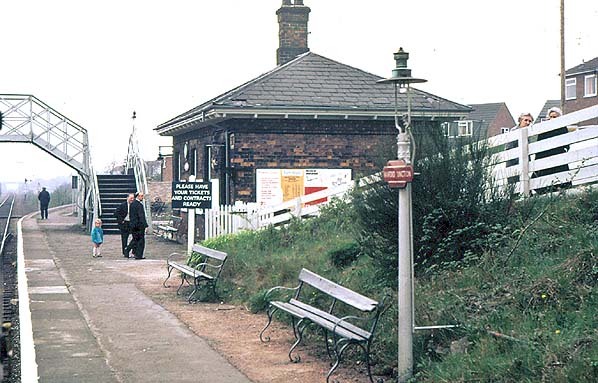 Rainford Junction station looking west in 1970. The up platform at Rainford Junction looking west on 10 April 1974. At this time the station was served by an hourly train in each direction that ran between Liverpool Exchange and Bolton. The former Ormskirk line platform can be seen curving off to the right. A view looking west along the down platform at Rainford Junction station on 12 September 1996. 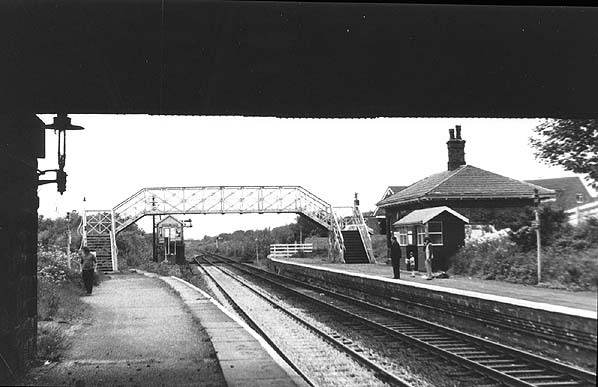 The up platform building was extant at this time and can be seen to the right. 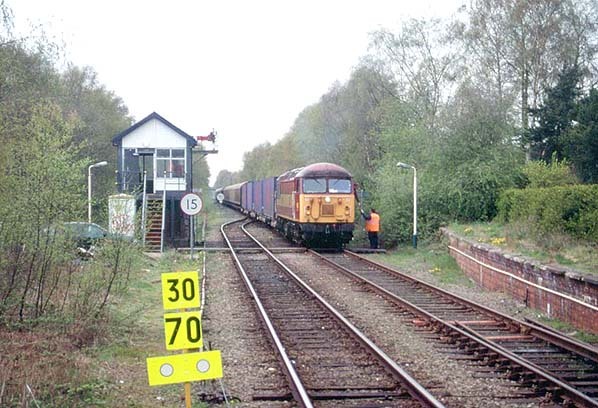 Looking west from Rainford Junction in the late 1990s. A freight train is proceeding towards Wigan on the former L&Y Liverpool to Wigan line. To the right can be seen the former Ormskirk line platform. Rainford Junction station looking east on 3 March 2007. A Kirkby train is seen at the down platform.